This is one of my best meals and the picture does not do it justice! Breaded tofu cutlets seasoned to perfection topped with a light and refreshing salad sitting next to a pile of delicious saffron risotto. Two things about saffron risotto (1) it is much easier to make than you might think and (2) saffron is not as fancy as it sounds. 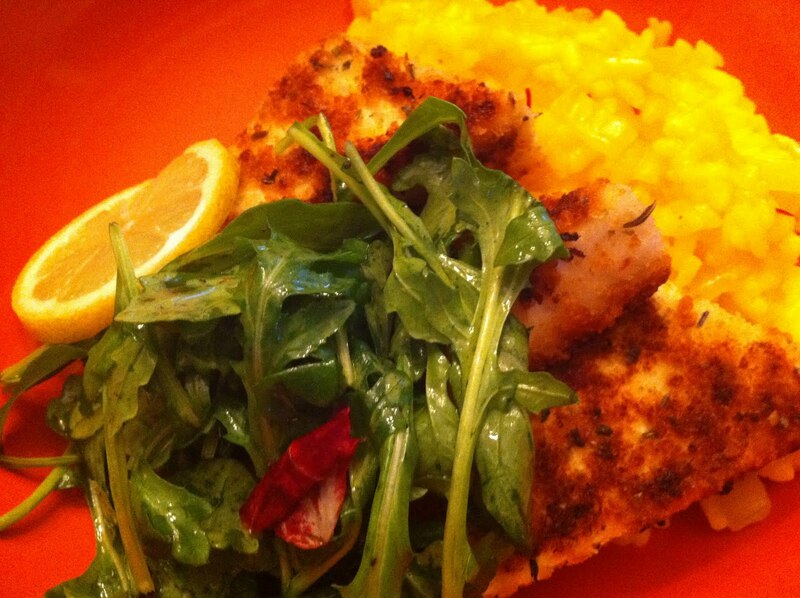 It is fresh and delicious and turns the risotto a gorgeous yellow color. This whole meal can be prepared rather quickly and easily and you will find yourself in Milan asap! Chop and saute the onion in olive oil in a large skillet with sides. Heat up the water and stir in the saffron to steep. When the onions are translucent, add the rice and stir around until translucent. Add a big ladle of hot saffron water and stir until absorbed. Then add another ladle of saffron water until it is absorbed. Stir often but start making the rest of the dinner. Keep adding water as each ladle full is absorbed until there is no more water left. While this is going on, cut the tofu in half through the middle, then half again, and then into triangles. Set up a breading station by pouring each element into a bowl. Use your judgment. I have no measurements here. Dredge the tofu in the flour, then the rice milk and then the panko. Heat up sunflower oil in a non-stick skillet and cook the tofu until golden on one side and then flip it over. Try to get the sides too. Mix the salad dressing in a deep mixing bowl. Add the mixed greens and toss. To plate, place the risotto on the bottom. Place the tofu gently on top and then pile a nice handful of salad on top. Garnish with a lemon slice. Enjoy!